Need to plan worship and save? RCL Worship Resources from Clergy Stuff™ is the way to go. We know that, as a leader, you want high-quality liturgical-resource preparation materials, but you'd rather spend your congregation's budget on other more important ministries. Whether you're Lutheran, Presbyterian, Methodist, Episcopalian, UCC, Anglican, or not denominationally affiliated, planning for a church service using the three-year cycle of the Revised Common Lectionary has never been as simple or as cost-effective than now. You can be confident, given Clergy Stuff's proven theologically-progressive track record with Narrative Lectionary resources, knowing that cultural sensitivity and gender-neutral language are central, including LGBTQ-friendly inclusion. What's more, make an effort to choose racially-inclusive images to better reflect on the reality of society. With RCL Worship Resources, you will feel confident going forward in gathering together—around and within God's word—and, best of all, at a price your council will definitely appreciate. 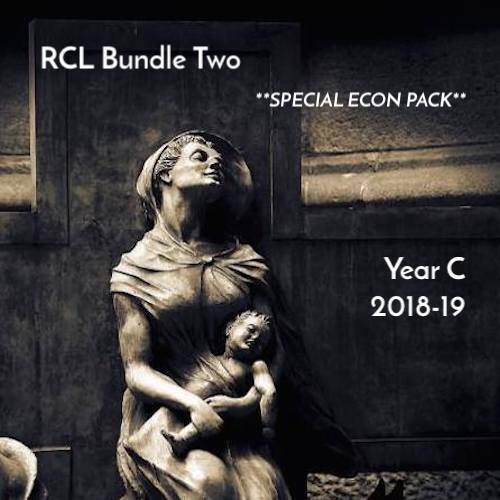 Our new resources for 2019 RCL Year C are available now for pre-purchase. We've designed the RCL Worship Planning Bundle 1 to include all the features you've come to expect to effectively organize your congregation' worship life. We offer these files as fully downloadable, "once-and-you're-done" content. The church worship service preparation Bundle 2 has been designed for congregations looking for a no-frills, inclusive, theologically grace-centered solution to develop creative worship expressions. It's all ready for you to download and use! The choice is clear. Most other worship resource providers are simply charging too much. Your congregation deserves high quality preparation materials for less. Clergy Stuff™ has supplied congregations for years with quality Narrative Lectionary packages. Now, we're offering the same for mainstream congregations using the Revised Common Lectionary looking for the identical quality and creativity. We firmly believe you'll find our resources useful and worthwhile, as well as more cost effective than other solutions. Below is a cost comparison of web-based liturgical planning materials you'll currently find online. This website lists various hymn selection manuals as well as worship- and sermon-preparation packages. For simplicity, I've conglomerated the cost into two packages to compare with RCL Worship Resources. Note: these resources are physical books, not digital resources. Several of the researched sites had both available. Some only had physical resources. At this particular worship resource site, it has two packages equivalent to RCL Worship Resources Deluxe package. This site's packages include an online subscription—essentially the same as digital goods. In addition, they offer readily accessible permissions to reprint hymns. This Christian resource provider has many items for free, but also has one package equivalent to RCL Worship Resources Deluxe package. As the first example, these resources are physical goods, not downloadable, but do come along with a CD-Rom. The last comparison website offers a subscription package for $20/month for three users. This is generally comparable to downloadable content, but you need to access the site monthly. The materials cover some, but not all the prep materials that RCL Worship Resources does. Given the fact that RCL Worship Resources writers continually update the material to reflect the changing context of our society and how your proclamation is applied to it, we hope that you'll give RCL Worship Resources a try. We know you'll enjoy using our worship planning materials. And at the sale prices for our packages of $149 and $129, you'll be saving your congregation's funds as well.